Trend to try is a mini series I’m starting that discusses how to incorporate this season’s biggest trends into your outfits – whether that be dipping your little toe into the water or jumping right in. There are, of course, varying degrees of how far you might want to take these trends, and I’ll show you both ends of the spectrum. At the end of the day however, while it might be worth pushing yourself out of your comfort zone a little and playing around with pieces you might otherwise skip over, remain true to yourself! If something feels totally weird to you, try toning it down or skipping it entirely. You won’t pull it off if you feel stupid wearing it! Today’s post is dedicated to… ruffles! Ruffles are a super easy way to add a little fun to an outfit. They create movement and add a layered feel. With the holidays just around the corner, ruffles might be your ticket to the perfect party outfit. 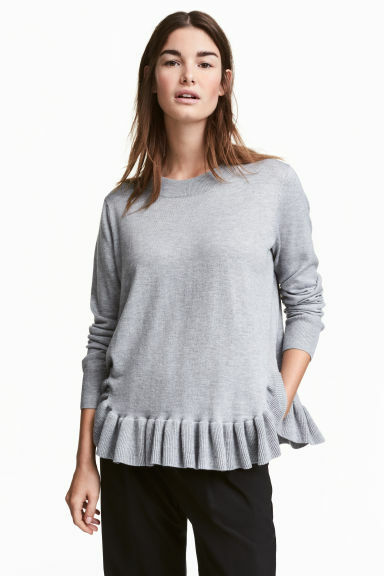 This first top is makes it very easy to pull off the ruffle trend. A muted colour keeps it from being overly flashy and you could dress it up or down by either wearing it as is or by pairing it with your favourite oversized knit cardigan. This next top is a bit more elegant with the cutout shoulders. This could easily be worn dressed up or down. This sweater has a ruffle detailing around the hem, which adds an unusual detail where you wouldn’t expect it. It’s peplum-like silhouette created by the ruffle makes it very flattering. This top adds a ruffle detailing to the neck. Pair it with pearls and a great heel and away you go! The v-shape ruffle and pink colour make this top very fun and girly, try balancing it out with a leather skirt. This is a fun take on the otherwise very basic white button down blouse, perfect for a work holiday party. Could this top get anymore fun? 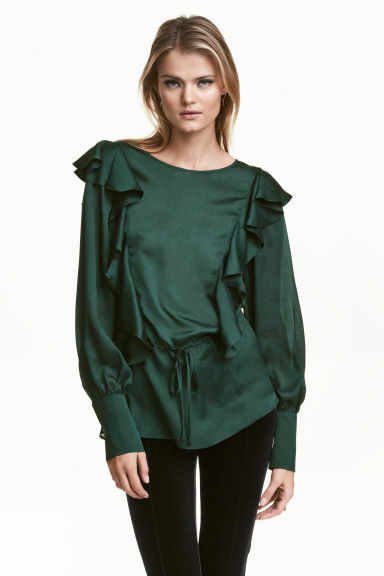 This is perfect for a holiday party, complete with ruffles over the sleeves and something else that’s really in right now, velvet! Ruffles and oversized sleeves get elevated to the next level with a satin finish and the perfect shade of evergreen. trend to try: statement sleeves!